Now you can view and compare all of the Facebook pages you manage in one convenient place! Many of the people we work with actually manage multiple Facebook nonprofit pages. That made for a lot of time-consuming juggling back and forth to see progress and results between accounts... Until now! We heard you, and we have something to help. 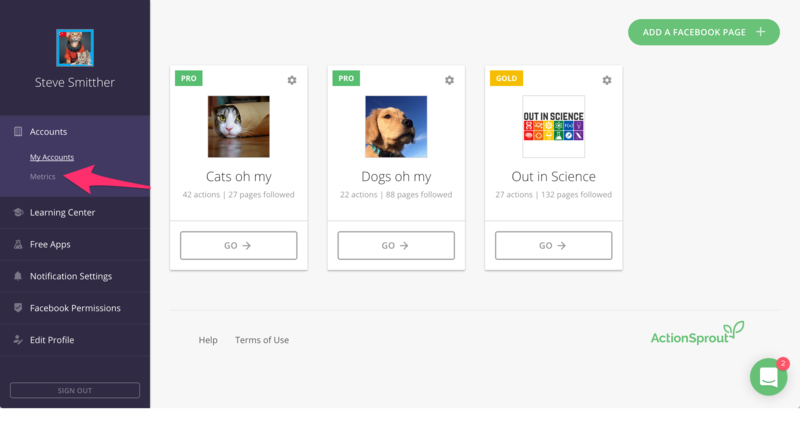 Now the ActionSprout tool lets you view metrics for all of your pages on the same screen! You can find this feature at the Accounts level of ActionSprout, before you select a Facebook page to work on. 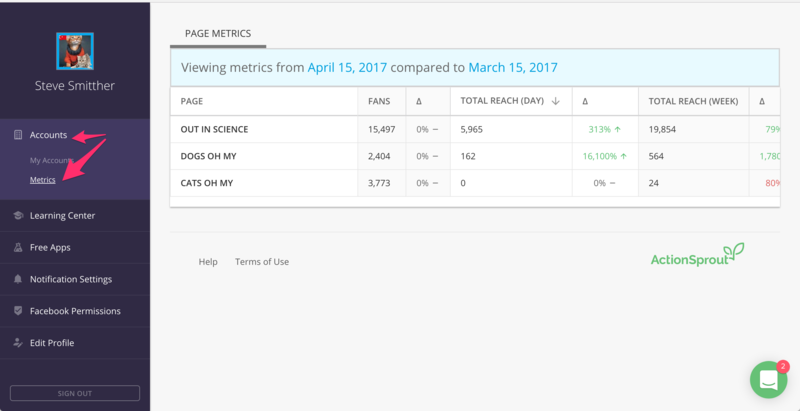 Just select Metrics right under Accounts in the menu on the left. 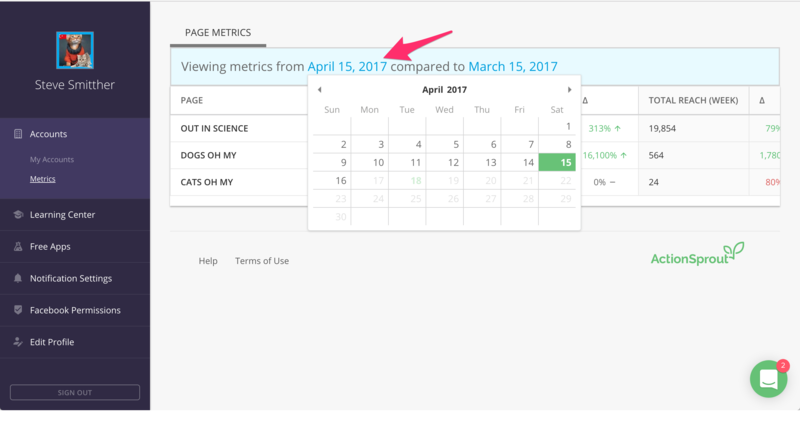 From there, you'll have the ability to define the time frame that you want to review. Just click on a date to get started. You'll then see a host of different metrics measured in days, weeks, and months for each of your Facebook Pages. To see the change of a metric over time, look in the column to the right, under the delta symbol Δ. The number of people who have liked your Page. They may or may not be following your Page or receiving your content in their newsfeed. The total number of people who received your content in their newsfeed. Paid reach + viral reach + organic reach = total reach. The number of people you reached through Facebook ads. The number of people who weren't Page fans who received your post in their newsfeed. This happens when a friend of theirs shares and/or engages with your post. The number of people Facebook delivered your post to. Remember, when you publish a post not all of your Page fans will receive it in their newsfeeds. Instead, Facebook will select a subgroup they feel will enjoy the post the most. The number of unique people who engaged with your post. Engagement includes any activity on the post, including reactions, comments, shares, clicks, and views. The number of times your video was viewed for three or more seconds. The number of times your video was clicked on. The number of times your photo was viewed. The number of times any links shared on your page were clicked and opened. Any miscellaneous types of clicks you receive on a post, such as clicking to read more or clicking on the time stamp to view only that post. The total number of new likes that your page itself receives. The total number of comments left on your posts. The total number of times your posts were shared. The number of answers you received to a question as a result of an ad. The total number of people who claimed an offer from your page. The total number of people who RSVP-ed to your page’s event. The total number of thumbs up clicks that your posts have received.